Fraser Firs are known for withstanding heat and retaining their needles once a customer has set it up in the house. But if not cared for they will dry out, trunks will split, and foliage will turn brown. How can I avoid all these problems? Cool Springs Nursery does everything we can to deliver a fresh tree. -We cut late. We wait till the last possible moment to cut so we can provide you with the freshest tree. -We keep it out of the sun. We do this by baling the tree and getting it out of the field in a half hour and into shade. Our holding area is in a shaded forest where we also put shade cloth over all the trees. -We keep them watered. Our staging area is on a creek bed and stays very wet all harvest long. -We do not send out any damaged trees. However, when the trees get to the customer they often lose the care we gave them. How the trees are stored and displayed makes all the difference in the world. Always store trees standing up and keep trees watered (moist) - Never soak the trees when bailed but mist in morning and evening helps the tree maintain moisture. Also - keeping the truck of the tree in either water or mulch/grass etc helps retain water. Examples are below of how some customers do this. Must display trees in warm climates in shade and have trucks in water. 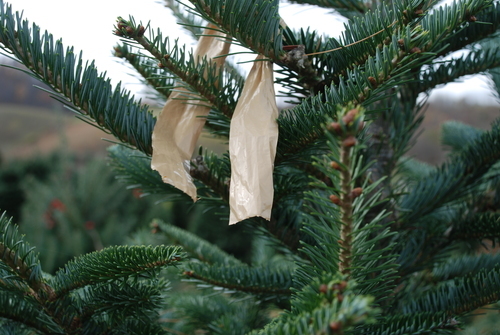 Put fresh cut on trees when bought. When a tree is cut the bottom of truck is sealed up with sap. By cutting off a 1/4 inch of the truck and having the customer immediately put in water allows the tree to take up water ensuring the tree to stay fresh way past holiday season. The ultimate in tree care on the lot is carried out by a Choose and Cut Tree Farm in Nashville Tenn. When the tree arrives they immediately cut a quarter of an inch off the tree and then stand all their trees up in a barn in about four inches of water. They have a cement floor and a six inch lip that retains the water in a pool where they place all the freshly cut trees. The trees re-hydrate and stay fresh right through the selling season. NOTE: THEY HAVE NEVER HAD A FRASER TRUNK SPLIT BECAUSE THEY TAKE SUCH GOOD CARE OF THEIR TREES. Other customers make their own "water troughs"...Build a pool of water, about 1 square foot per tree using landscape boards that are about 5 inches high. Place them around the perimeter and then drape plastic (use a thick mil plastic) and then fill with water. If you do not have inside storage that is cool cover the trees with the lightest winter protection material that you can get (call us if you need a source). This cloth is so light that you can put it right over the tops of the trees. No structure is needed the tops will hold it up and then use string to tie it down. If you are unable to build a water troughs there are many other ways to keep your tree fresh, give us a call and tell us about your setup and we will be glad to give you other suggestions. With having almost 40 years in the business we have seen almost every trick in the book and would love to help you out. In southern climates a tent should be used over the displayed trees and in more northern regions where temperatures stay 50 degrees and below less care is needed. But even then wind and sun will dry out trees even in a cold climate and it is best to at least cover the trees with winter protection material if you can not cut and re-hydrate with water when you receive the trees.